Moles live underground and surface only occasionally. Their cylindrical bodies and powerful front claws are ideal for digging. Moles burrow close to the surface, often leaving visible ridges. Mole hills are places where the mole has pushed up earth above the surface; new mole hills appear during periods when the soil is damp – generally spring and autumn. 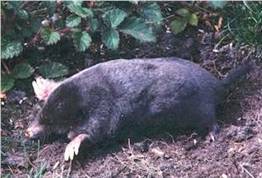 The adult mole can measure anywhere from 12 to 20 cm in length and have dark grey or brown velvety fur. Its eyes are small and its broad front feet have strong claws for digging. Moles are insectivores. Most moles do not eat plants, but feed mainly on earthworms (their favorite food), insect larvae and arthropods (insects and crustaceans). They find by the sense of touch. Some moles may eat tubers and the roots of garden plants. Moles do not hibernate but remain active day or night all year long. During the winter, the mole will continue its quest for food deep below the frost line. Surface activity occurs most consistently in the spring and fall. Moles are solitary animals, and it is likely that only one or two moles are responsible for the damage to your lawn or garden. Moles have only one litter of 3 to 4 young in the spring. These young will stay with the female in her tunnels for about a month, and then will start creating their own tunnels, reaching adult size in about four to eight weeks. The young may stay in the area several months after they have been weaned before finding their own territory. Young females will not breed until the following year. Holey Moley Mole Control Co. Phone: 604-839-4074 Messy lawn? Let us end your frustrations. See our web site for details.